The home party and this post were sponsored by P&G. The opinions in this post reflect the guests in attendance. Recently, I gathered together local moms for a fun in-home laundry party to swap and share tips, tricks, routines and real mom laundry advice! Most importantly, we discussed how to keep our kids safe in the laundry room. We all had a great time swapping stories in a Q&A format asking questions such as if others used fabric conditioner or dryer sheets, what their routine was, how they tackle sorting, and so much more. Today, I’m going to share what works for other moms to help you find solutions to help you tackle your own laundry piles. More on the mom laundry advice in a bit, but first let’s start with a get-to-know-yourself quiz! What’s Your Parenting Safety Style? All of our personalities, homes, and parenting styles are different. Just like we each have different tips and tricks and shortcuts we love when it comes to laundry, we have different parenting styles, too. Our parenting style even affects how we approach childproofing and safety! Tide worked with world-renowned psychologist, Dr. Shefali, to develop this fun and easy 6-question quiz to reveal your own parenting safety style. 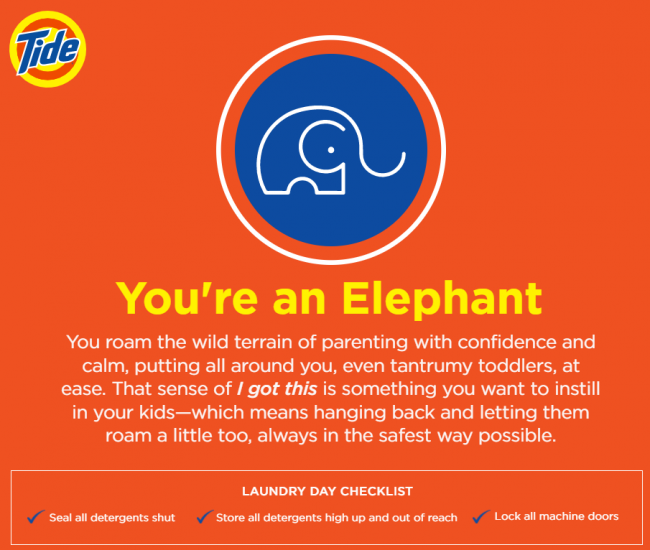 My result was an Elephant – confident, calm, and ready to hang back a bit to let your child roam and explore as long as they’re safe! At the end, there’s a 3-step checklist for making sure your laundry room is safe. Take the quiz here and let me know what your result is in the comments! Just like the quiz results share, the most important message shared during the party was safety. There are lots of different ways to tackle the laundry loads, but in any routines or laundry tricks the most important thing is to ensure your children and family stay safe. » Seal All Detergents Shut: Keep your detergents packaging closed and secured. Tide PODs have the most innovative package safety features in the industry with the Child-Guard™ zipper pouch and Child-Guard™ tubs. That makes them very difficult for young children to open, but easy for adults. 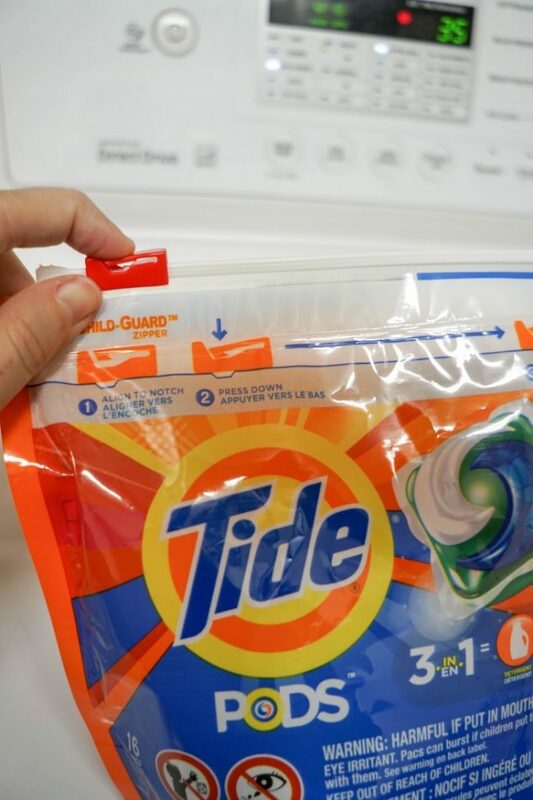 The Tide PODs Child-Guard™ zipper pouch needs to be aligned with a notch along the zipper track first, then just press down on the tab and slide it along to open the pouch. 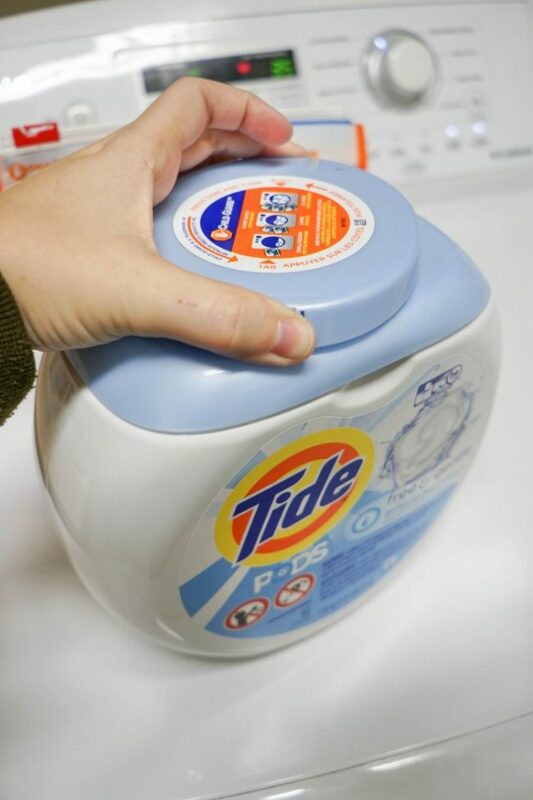 For the tubs, you’ll simply grab both sides of the Tide PODs Child-Guard™ lid and squeeze while twisting to open the tub. Don’t transfer your soaps or detergents to cute, but unsafe, packaging. The manufacturer packaging will have the pertinent details you may need in case of an emergency and are best designed to safely store the product. Keep in mind that not all packaging is created equal. Tide understands the importance of safety and has Child-Guard™ safety features exclusive to the Tide PODs product line. » Store All Detergents Up High and Out of Reach: Take special care to store your laundry detergents and products up high and out of reach of young children. It’s best to store them in a closed cabinet or in a bin so they stay out of sight. Never leave your washing detergents on top of the washer, dryer, or counter tops or anywhere else where they will be in easy reach. » Lock All Machine Doors: Use the locking functions on your washer and dryer to secure and keep them closed between cycles. Or, look for babyproofing products to help secure the machine doors closed. 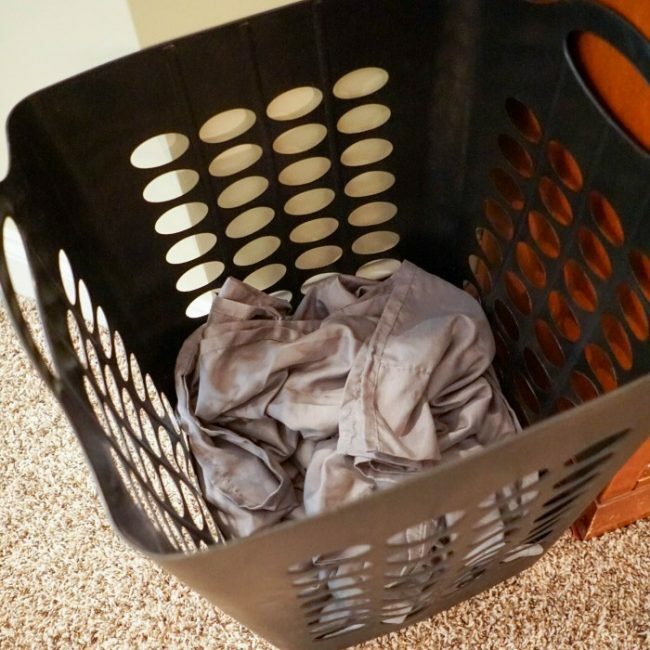 As a bonus, following this step will help you keep on top of your laundry cycles, too! No more lingering load left in the washer or dryer drum! Now that our laundry rooms are safe and secure, let’s simplify our laundry routine with these 10 easy tips and tricks shared from moms that can help you tackle this never-ending household responsibility! 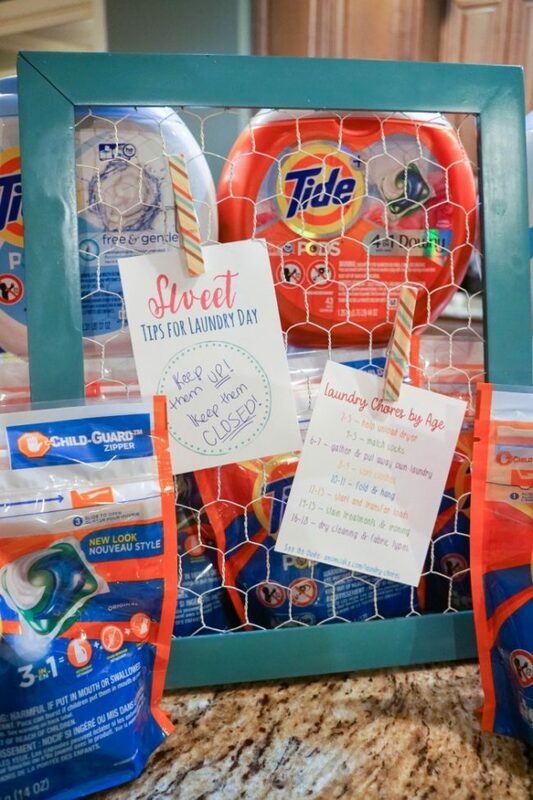 These laundry shortcuts were shared from real moms at our laundry safety party. We had so much fun swapping stories of what worked for us and our own tidbits and secrets to simplify the “load” of laundry duty! 1. Hamper in the Hallway – One mom keeps the laundry hampers out in the hallway. All the kids toss their dirty duds out in the hallway so there are never any dirty clothes on their bedroom floor. This also helps her to keep clothes that are still clean, put pulled out of dressers, get put back away instead of rewashed. 2. 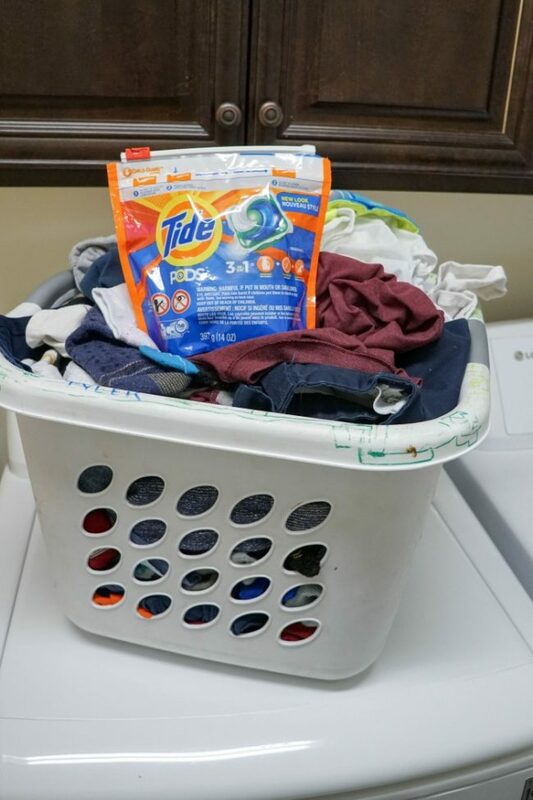 Laundry with PODs – The laundry routine is much faster with Tide PODs that take out all the measuring, mess, and guesswork. Just add 1-2 Tide PODs, depending on the load size, and start the load! 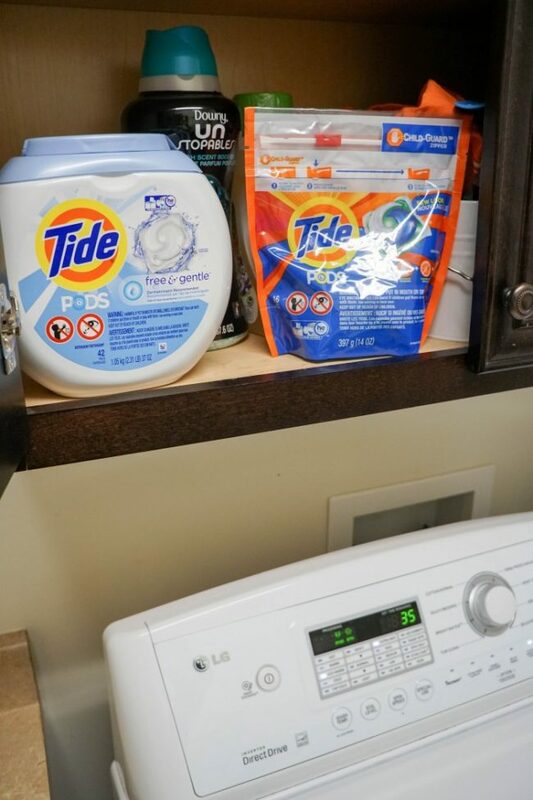 Tide cleans our laundry really well so that we don’t have to rewash or deal with stink issues, saving us tons of time! 3. 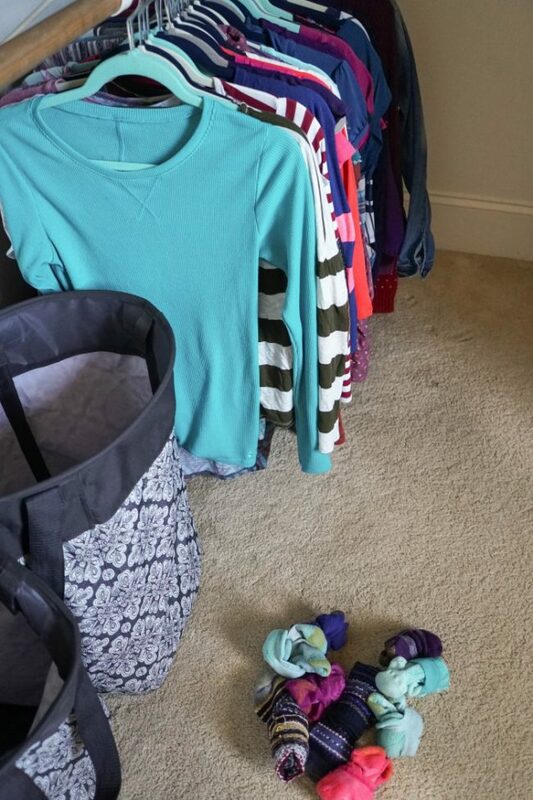 Mass Sorting Pile – Another mom hauls all her clean laundry to the landing. She’ll then create piles for each family member to quickly and easily sort through all the clothes. Older kids can then be in charge of folding and putting away their own laundry and younger kids’ clothes can easily be folded and put back into one of the laundry baskets to be put away. 4. One Type of Socks – One thing all the moms tackled was dealing with matching socks! Most of the moms in our group had come up with solutions to simplify sock matching. Some used only one exactly identical pairs of socks for all their kids (that fit the same size) such as all plain black socks. Another used one specific sock brand per child to make it a cinch to recognize the difference and sort quickly. You could also stick to a specific sock style – such as tall, short, and ankle socks with only one style per child to speed up sock sorting. 5. Hang Everything – A shortcut one mom loves is to hang everything. Ditch the folding step completely and just grab a pile of hangers. She’ll hang the clothes right in the laundry room and then let the family members take their clothes up to their rooms. This saves the piles from getting unfolded in route to the bedrooms. She loves how at the end of hanging all she has left is a small pile of socks and underwear. 1 Day a Week – Set aside one day of each week to be intentional about laundry duty. Turn up the washing machine chime and check in on the loads about every hour to switch the laundry over to the dryer and start a new load. If you have a lot of laundry to tackle you can even skip the sorting and folding until all of the laundry is done to streamline your efforts. A Load a Day – Start a load of laundry each morning as you’re starting your day and then be sure to move the load over to the dryer after you finish other morning household tasks. Finally, sort, fold, and put away the clothes so you’re never stuck with an unfinished job from the day before. 7. 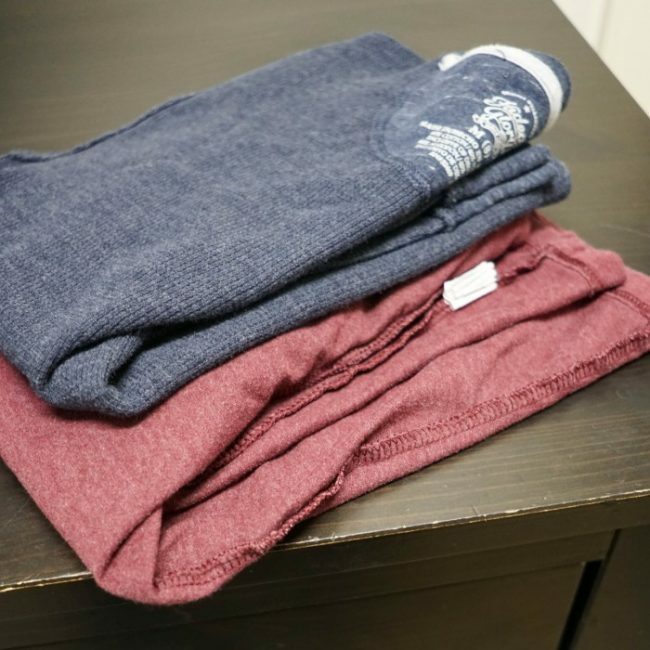 Return Clothes as Received – Several of the moms agreed, they didn’t flip clothes back right side out or unroll socks. If their children were too lazy to flip the clothes right side out or unroll their socks before they tossed them into the laundry basket, then they stayed that way after being washed and sorted. This can also help kids recognize their role in the laundry process. 8. Sort with a Mesh Bag – Each child can stash their socks and underwear inside a mesh wash bag. You can loop it onto the side of their laundry hamper to make it easy to sort right as they throw their clothing into their laundry basket. Then, when it’s time to wash the mesh bag can be cinched closed and all their socks and underwear are together and won’t be tangled inside other clothing. 9. Kids Can Help – Moms got the kids involved in helping to sort or fold their own clothes. Most moms had their kids put away their own clothes piles, as soon as they were old enough to do so! Here’s a handy guide of laundry chores for kids by age! 10. 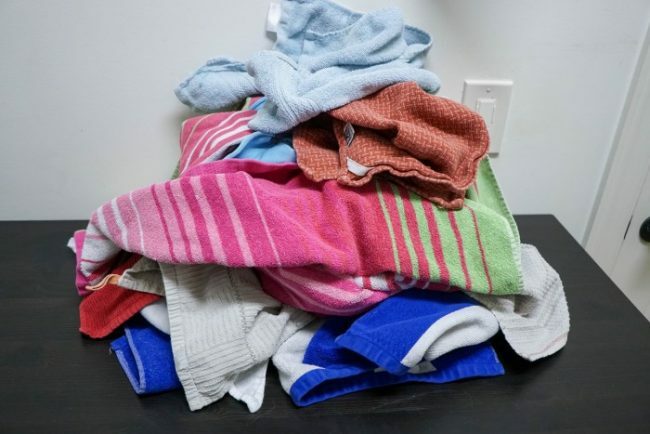 Sort Out Towels – One quick way to speed up the sorting process is to pull out towels first. Towels can take up a lot of space in the laundry basket. Instead, we set aside the bath towels and hand towels right as they come out of the dryer. They’re a cinch to fold and create a stack so they don’t get moved around the house during the sorting step. What are your best tips and tricks for an easy and safe laundry day? I love the tip about returning clothes as received. I don’t know how many times I have turned clothing right side out and unbunched socks. I took the quiz and it turns out I’m a cheetah. The bunched up socks are the worst!! I’m an elephant, too! This is a good reminder that there are some potential risks even in the laundry room, though! These tips are so great. The one about not unrolling things and not flipping them to wash had me laughing because I deal with this so much with little ones! These are really awesome tips! Thank you so much for sharing! With a little one growing up fast, it is crucial for us to have a list for our routine and household chores to keep everything in check. Having a safety precaution is important too. Great pointers. Thank you! I tried just having one type of sock. It sort of worked…until they were given socks as gifts. I do keep the hamper in the hall. My husband does our laundry! I can’t wait to share your tips with him! Our laundry is in the garage so my son doesn’t have access to that room but these tips are really helpful! You little laundry space is so cute and organized. We do not really buy Pod too much because I like the liquid. I agree keeping them up and away is important when you have littles. These days it is SO important to have a laundry safety checklist. Love how these pods make things so much easier – no measuring involved! This is a handy checklist, especially for new moms who might be overwhelmed. It’s all too easy to forget to close the containers.